Did Mary DBTS live both here and the Bivins st. house? Designed by George Watts Carr, Pinecrest was built in 1928 for developer James Cobb, in the western portion of the Forest Hills neighborhood that both men were involved in creating. 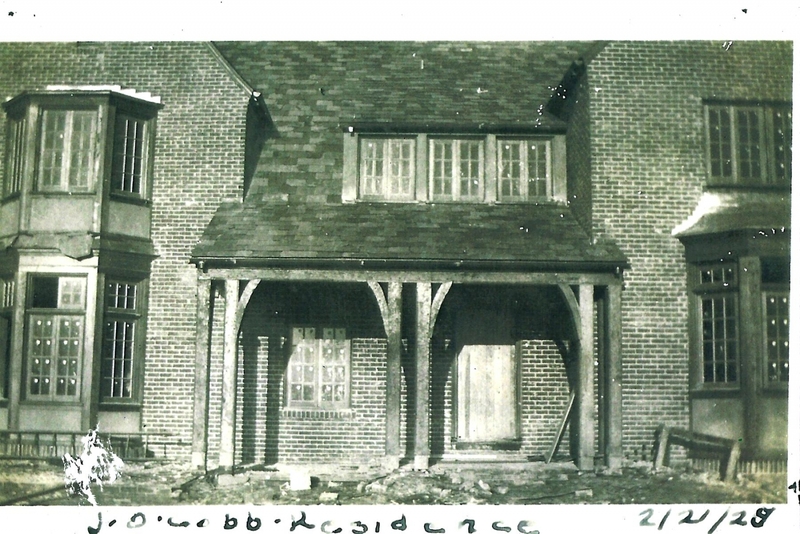 This and the following photos show the house as it neared completion in early 1928. 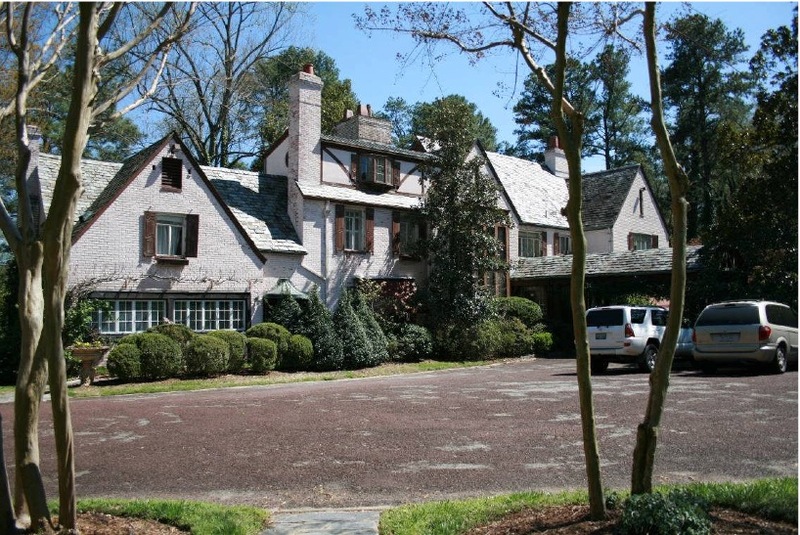 The Mary Duke Biddle Estate is located at 1044 and 1050 West Forest Hills Boulevard along the western edge of the fashionable early-twentieth-century Forest Hills subdivision in the City of Durham, North Carolina. It is [...] situated prominently on land that rises to a plateau above Forest Hills Park. Comprising 8.562 of the 13.17 acres assembled during the mid 1930s and 1940s by Mrs. Biddle, the estate is an irregular parcel of land bounded by Kent Street on the west, neighboring properties on the north and south, Westwood Drive on the southeast, and Forest Hills Boulevard and Forestview Street on the east. Fences delineate roadside boundaries, and forested groves and bamboo thickets largely obscure the buildings, structures, and grounds from view. Set back several hundred feet from Forest Hills Boulevard and Forestview Street atop an east- facing hill, “Pinecrest” the focal point of the estate, is a large and handsome Tudor Revival dwelling designed by Durham architect George Watts Carr Sr. in 1927 for Forest Hills developer James O. Cobb. From 1935 through 1958, extensive additions and interior renovations made to the dwelling for Mrs. Biddle under the direction of New York designer Karl Bock included Colonial Revival, French Eclectic, Oriental, Art Moderne, and Art Deco elements. Bock also made plans for Mrs. Biddle’s auxiliary housing and recreational and landscaping needs. 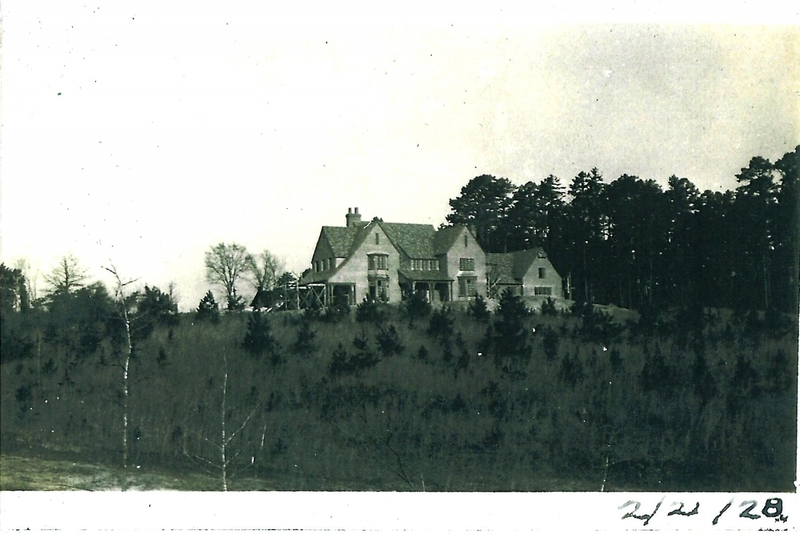 During the late 1930s and early 1940s, he designed and supervised the construction of one additional dwelling, and designed or planned for the installation of three outbuildings and nine structures that contribute to the historic character of the property.3 The Cottage (5) at 1044 West Forest Hills Boulevard, constructed in the English Cottage style, compliments the original Tudor Revival style of Pinecrest. 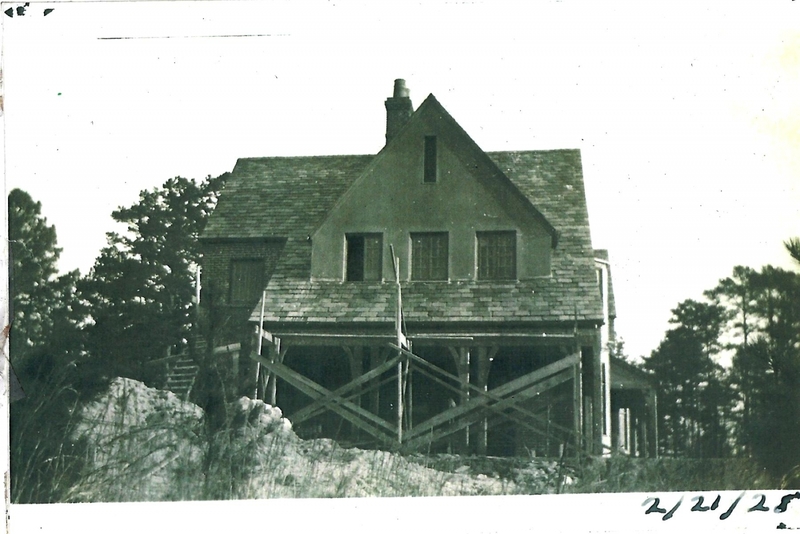 A much smaller dwelling, it has an attached garage and was constructed near the northeast boundary of the property to accommodate servants and automobiles. A gasoline pump (6) was installed adjacent to and west of the garage. A cast iron picket fence with two ornamental gates (7) was erected along West Forest Hills Boulevard.4 Two large brick arches (2 & 3) were erected northwest and southwest of Pinecrest to mark the beginnings of footpaths that interconnect on the grounds of the estate. A picnic area with a stone fireplace and a nearby wading pool fed by streams that emerge from stone- lined grottoes (4) were created northwest of Pinecrest in a grove of trees. A recreational complex with a bathhouse (8) tennis court (9), a swimming pool (10), and a stone fireplace (11) was constructed southwest of Pinecrest near the west boundary of the estate. 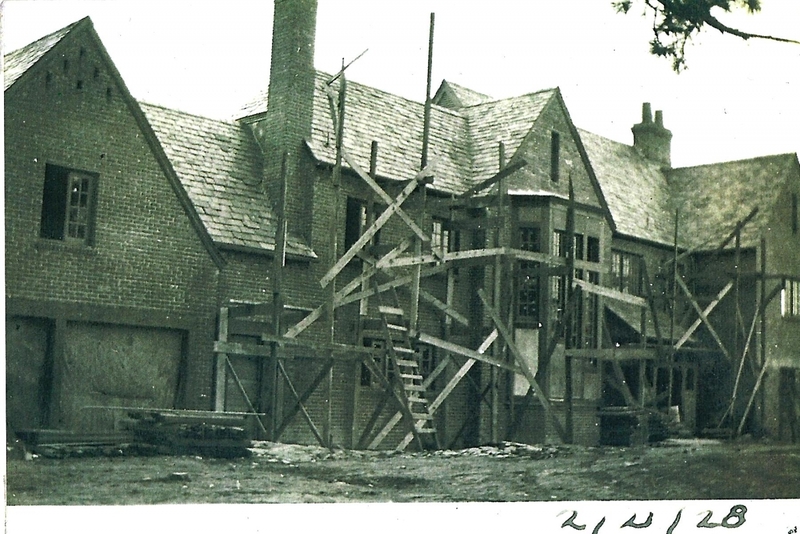 An extensive pergola (12), a gardener’s cottage with an attached greenhouse (13) and a storage garage (14) were added west of the dwelling along Kent Street. Ornamental shrubs, small fountains, birdbaths, and statues dot the estate though an elaborate rose garden once situated west of the house no longer exists. Two non-contributing structures, a contemporary metal storage shed installed northeast of the storage garage (15) and an early-twentieth-century playhouse recently placed in a garden northwest of Pinecrest (16) do not distract from surrounding historic resources. Pinecrest, The Cottage, the gardener’s cottage and greenhouse, the gardener’s garage, the swimming pool, the bathhouse, and the tennis court are listed on the National Register as contributing within the Forest Hills Historic District (NR 2005). UPDATE (December 2018): In a meeting on Monday, December 17, 2018, the Durham City Council unanimously approved zoning changes for Pinecrest and surrounding properties that would preserve the historic structure - redesigned as two dwelling units - while adding as many as 46 townhouses on adjacent land. The development plan and new zoning allow for increased density while promising a stylistic match to the fabric of the surrounding neighborhood. The late James Duke Biddle Trent Semans, who inherited the property in 2012, had conducted a multi-year search for a developer that could produce a proposal for Pinecrest's future that would meet these criteria. Master plan drawings produced for the in-fill development by Atlanta-based Phillip Clark Custom Builders show how the new residences will wrap around the original building (Kent Street, the western boundary of othe project, is shown here at the top). For additional information, see the developer's project page and coverage in the News & Observer. This building was the subject of a What's It Wednesday?! post on Open Durham's social media accounts (Facebook and Instagram), the week of December 19, 2018. Follow us and stay tuned for more finds!